Belly has only ever been in love with two boys, both with the last name Fisher. And after being with Jeremiah for the last two years, she’s almost positive he is her soul mate. Almost. Conrad has not gotten over the mistake he made when he let Belly go even as Jeremiah has always known that Belly is the girl for him. So when Belly and Jeremiah decide to make things forever, Conrad realizes that it’s now or never–tell Belly he loves her, or lose her for good. Finally, we have the final novel of the Summer series. Who Belly will choose? Conrad or Jeremiah? That’s the main answer every lover of this series wants to know. The story begins 2 years after the end of It’s not Summer Without You. Belly is a freshman in the same college as Jeremiah and her best friend. She is dating Jeremiah but she never forgets Conrad who studies in California and is troubled when she sees him. Belly is nineteen now and has grown up, the innocent summer holidays are the past and the nostalgia is gone. However, she remains innocent and naïve and she needs her mother. I don’t want to tell more about the story because few things happened in the novel are surprising and important for the evolution of the plot. Jenny Han has written a beautiful and realistic story. It’s heartbreaking, Belly has to face so many problems because of the Fincher brothers who each hurts Belly’s feelings. In this third novel, it’s Jeremiah’s turn and even if Belly have some hesitation and doubts between the security and the passion, the reader will know what will happen, it’s very easy and understanding. We have finally some chapters with Conrad’s point of view and it’s worth to wait because these chapters are amazing and emotional. We finally have a look into Conrad’s feelings toward Belly since several years and we understand that he is not the bad guy as he seems to be. He becomes more sensible and more sympathetic… and even more appealing ^^ On the contrary, Jeremiah is described as a total jerk and is not anymore the perfect guy it looked like in the previous books. 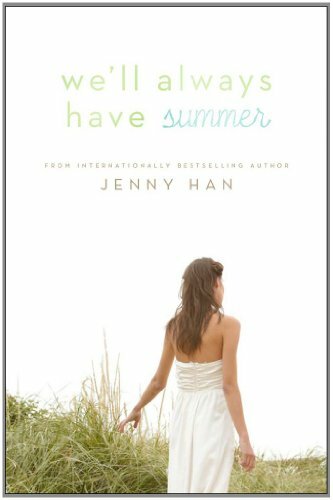 We’ll always have summer is a perfect conclusion to the series, thanks to Jenny Han who has written one of the most beautiful YA contemporary book series I’ve ever read. Le point de vue de Conrad était attendu depuis le début et est vraiment réussi. Merci pour cet avis 🙂 c’est un livre que j’attend avec impatience tu as beaucoup de chance de l’avoir dejà lu aux vus de sa date de sortie ! Si cela n’est pas trop indiscret comment cela se fait que tu es eu l’opportunité de le lire si en avance ? Oui j’étais surprise et aux anges de pouvoir le lire! Je l’ai reçu de la part de l’éditeur pour en faire une chronique. En tout cas, j’adore ton avis et je suis (presque trop) impatiente de lire le tome 2 et ce tome 3 qui sort à la fin du mois prochain. J’avais commencé la série en français, mais ça ne sort pas assez vite à mon goût, alors je me mettrai peut-être à les lire en VO. En plus, la couverture que j’ai n’ira plus avec celle du tome 2 parce qu’elles vont être rééditées. Je vis un gros dilemme en ce moment. Tu devrais les lire en VO, c’est très facile et tu n’auras pas à attendre plus d’un an pour avoir la suite et fin de la trilogie!